The organization conducts of the Russian Telegraph club of Russian CW Club Russia, Novosibirsk. - in the memory of our members: 9A2WJ; 9A3VV; 9A9L; DL1ARD; HA9SU; LZ1CY; LZ2HX; LZ2PT; R0JY; R0LT; R1A-12; R3LM; R4YY; RA3AK; RA3YN; RA3ZA; R4AK; RA4CQ; RA4WA; RM5Z; RN3QQ; RO2DX; RU4NAM; RU9AZ; RU9CI; RV6LCI; RW3SW; RW4HO; RW6MF; RX1CV; RZ7M; U0AL; U3ST; U5EX; UA0LS; UA1AIK; UA3IFP; UA3LDZ; UA3WW; UA3YAA; UA4L; UA9DM; UA9OA; UF0A; UN0BB; UN1Z; UN3F; UN5C; UN7CH; UN8GV; UR7GW; UT2GW; UT5CY; YU1RW. Assessment time for all the participants - 60 minutes. The hour mini-test consists of two rounds 30 minutes. Repeated QSO with correspondent allowed in each round, and also within one tour on different ranges. D. SWL-Single RX-one W/the observer or several p/observers - one receiver - the overall standings. Guests of the club RCWC transfer control number of the RST and the ordinal number of QSO, since 001. The ordinal number of the touring through. 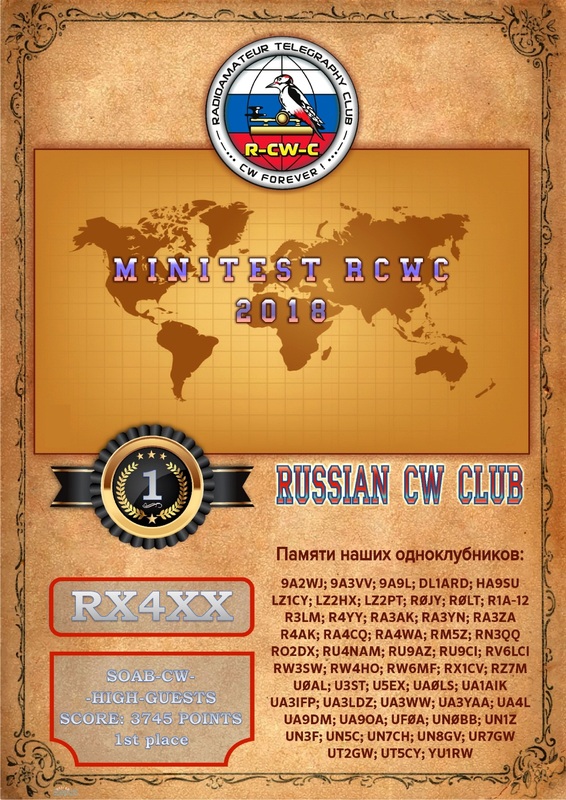 The members of the club RCWC transfer control number of the RST,the abbreviation "CM" and their membership number throughout the mini-test. Note: CM - (club member). For each radio all the participants charged 1 point. Multiplier is different radio stations of the members of the club RCWC. A member of the club RCWC for all participants gives 1 point for multiplier once during the mini-test, regardless of the tours. The product of the total points for the communication on the multiplier. The counting of the party of the result is not mandatory. All participants, who sent the reports, are awarded with electronic diplomas.
.:: NOTE FOR SWL`S ::. For SWL`s of scoring for two-way radio watch concerned on similar terms.
.:: ADDRESS FOR SENDING REPORTS ::. With all of the radio stations, working Telegraph in the competitions.